If Kelly has any self-respect, he made a demotion of the Mooch (demoochen) a condition of taking the Chief of Staff helm. Kelly also ought to have other conditions. One being: Mr. President, stop shooting off your brainfarts unchecked! A WP comment suggested the following: Make it clear to the President that Kelly will step down immediately the moment Trump twitters the first demonstrable lie. And because Trump cannot be counted on to keep promises and show some of the discipline a general would expect, I say Kelly is next. Last edited by Oystein; 31st July 2017 at 01:44 PM. It almost looks like Trump appointing him was a mistake. Nonsense. Game of Thrones characters are cool. Which makes Trumps suitability for office look like...? Scaramouche's departure must just about be setting a record for being mentioned in the most ISF threads, including at least two new ones. Only the best for Trump! Kelly also ought to have other conditions. One being: Mr. President, stop shooting off your brainfarts unchecked! Why would Trump tweet this the day Kelly took office? Perhaps because it IS a topic of contention? It's constitutionally dubious because the Justice Department (and any special prosecutors appointed under its authority) is part of the Executive branch, for which the President has constitutional authority to fire appointees. And your misunderstanding notwithstanding, the appointment of the Attorney General, and the requirement that the appointment be approved by the Senate (not the full Congress) is covered by Article II of the Constitution. As one wag said,who will be the next to be evacuated from Donkirk? I'm betting Kushner will go back to run the family business. He won't adjust well to Kelly and more will come out about his talks with the Russians. Between Kelly running the show and a soon to come series of revelations about Jared and Russia he'll leave or get forced out. Who will do all the work if he leaves? The Orange Menace put him in charge of almost everything. Interesting choice, given the broad scope of Jared's portfolio. Sessions was dragged kicking and screaming into his (sort of) recusal. I don't think he deserves a lot of credit for the ethical virtue of the decision. But the Hair doesn't think about the consequences of his actions. If he did, he wouldn't have colluded with the Russians. What consequences? Jared spent his time so far learning about the Middle East, and recently reported that he has by now figured out that it is a very complex situation. The replacement might conceivably know this already, and thus pick up where Kuchner leaves. Let us all observe a moment of silence in respect of these great souls who have fallen while serving our country... oh hell, I just couldn't stop laughing! 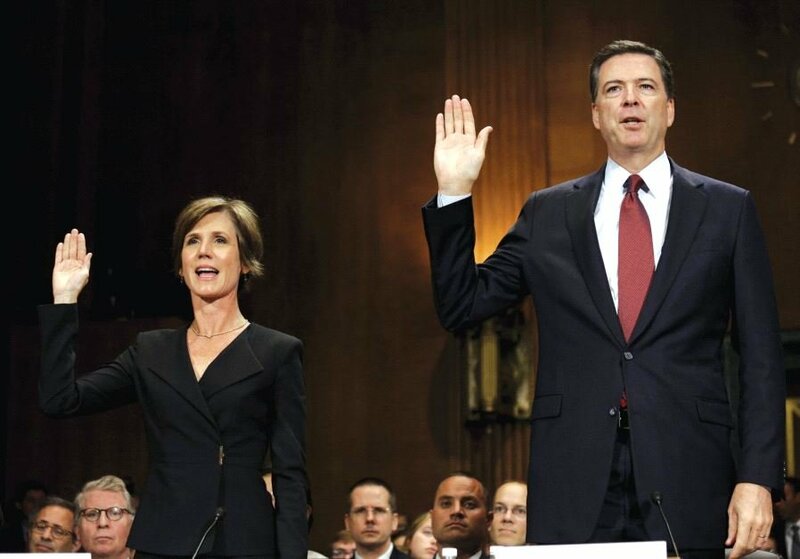 I'm actually a bit sad about Yates and Comey. The prosecutor, who was appointed by a special panel of the United States Court of Appeals for the District of Columbia Circuit, could investigate allegations of any misconduct, with an unlimited budget and no deadline, and could be dismissed only by the Attorney General for "good cause" or by the special panel of the court when the independent counsel's task was completed. As the president could not dismiss those investigating the executive branch it was felt that the independence of the office would ensure impartiality of any reports presented to Congress. However, there have been many critics of this law including Supreme Court Justice Antonin Scalia. Many argued the new Independent Counsel's office was a sort of "fourth branch" of government that had virtually unlimited powers and was answerable to no one. However, the constitutionality of the new office was ultimately upheld in the 1988 Supreme Court case Morrison v. Olson. All Congress has to do is to re-instate the provisions from the Ethics in Government Act which instituted it. Last edited by ddt; 4th August 2017 at 02:03 PM. And Bannon seems to have fallen into disfavor with Stephan Miller now probably the most powerful member of the Nationalist wing of the White House. Evidently Trump's base as exemplified by Breitbart are mad at General McMaster. Alt-right's been sharpening their knives for McMaster for a while. I consider it a good sign that my early enthusiasm for his hiring was not misplaced. Media Matters has a story defending him and claiming, among other things, that Russian bots are pushing a #FireMcMaster hashtag. No idea if that's true. Interesting claim, though. Sort of last week's news now. Not sure why Russia wanted to test this line out. Do they hold a grudge against Susan Rice? p.s. I'm changing my bet to Tillerson. Last edited by d4m10n; 7th August 2017 at 08:58 AM. Changing my vote (again) to Kelly. Sorry, but Kelly is not in the Chain of Command for the Nuclear Twitter Codes. I'm still going with Kushner. The FBI seized documents in the raid on Manafort's home related to the meeting with the representatives of the Russian government. That means there's something there. Getting him out of the White House will become crucial soon. He's the only person in the administration (that we know of now) who was at that meeting and that's where the collusion began. I'm still going with Kushner. The FBI seized documents in the raid on Manafort's home related to the meeting with the representatives of the Russian government. That means there's something there. Getting him out of the White House will become crucial soon. He's the only person in the administration (that we know of now) who was at that meeting and that's where the that collusion began. The evidence is that like many top executives of his type he doesn't actually do anything. Probably better replacing him with a magic-8-ball, at least that has a chance of being right about something. Oh man, I want the executives you've had. I'd love it if our top execs didn't do anything. Instead, they do things that make no sense because they confuse position with expertise. It looks like some leakers are pushing the North Korea situation (RE: miniaturized nuclear warhead) to help Trump by distracting form the Russia investigation. If it looks like this could work, Trump might as well look to bomb North Korea, which (hopefully) the Generals won't support. If Mattis and/or McMasters are forced out you better sell all your shares in Korean companies. I'm leaving my chip on Sessions. He's already crossed Trump, his firing would be slightly less contentious than firing Mueller directly, Trump's already tried bullying him out, so IMO it's just a matter of time and sufficient distraction until Trump feels safe firing him. Sessions is getting cover from his brethren in the Senate, who would have to confirm his replacement. Trump is currently feuding with McConnell. It would be entirely characteristic of him, and would give him a fig leaf of plausible deniability, to fire Sessions in retaliation. Is he aware of who his Secretary of Transportation is?